A cellular automaton is a mathematical object that consists of (usually) an infinite regular grid of cells, each of which may be in a finite number of states and a set of transition rules, according to which the cells change their states simultaneously in discrete time steps. The same rules apply to each and every cell. Most commonly the number of states is 2. In one of the states the cells are often said to be alive, in the other to be dead. Sometimes, the entire set of cells is referred to as a generation. An application of transition rules to one generation produces another generation and then is applied again, and so on. For rule 2n, the marked cell is alive in the next generation if at least two of the three cells in the diagram are alive presently. For the same purpose rules 3n and 3d require at least three cells, rules 4n and 4d require at least four live cells. Reduction in the number of required live cells may result in stable structures - immortal barren populations that reproduce themselves with every application of a transition rule. For example, if in rule 4n the presence of three live cells ensures inclusion of the marked cell into the next generation, then four live cells that form a 2×2 square remain alive indefinitely. However, the way the above rules have been set up, for any of them, any finite population will die out in a finite number of steps. In fact, a problem with rule 2n has been included in the 1973 All-Union Soviet Olympiad [Savchev, pp. 149-151]. One solution by a Russian tenth-grader A. Gomilko that I'll present shortly got a special prize for elegance. The problem was twofold. First, it was required to prove that, for rule 2n, any initial population will eventually die out. The second part of the problem stipulated that the extinction of life will take place in a number of steps not exceeding the number of live cells in the initial population. which merely says that a live cell would be alive if the process started with a bigger live population. which simply says that no member of a population of live cells contained in a grid rectangle ever crosses outside that rectangle. The two properties (2) and (3) suggest a way to prove the first part of the problem. For a rectangular live population R, a pattern of extinction is easily discerned by experimentation. Any (finite) live population can be included into a rectangular one, where it stays indefinitely, by (3), and expires at least as fast as the latter, by (2). Now, A. Gomilko's solution for the second part of the problem and rule 2n. The proof is by mathematical induction. Clearly, a lone live cell disappears in 1 step. Assume that a population of k live cells, k < n, expires in no more than k steps, and consider a generation G with exactly n live cells. Let R be the minimal (grid) rectangle that contains all live population of the given generation. Along with R, we shall consider two sub-rectangles: one Rb is obtained by omitting the bottom row of cells, the other Rl by omitting the leftmost column of R. Since R is the minimal rectangle that contains GL, the dropped row and column are bound to contain some live cells. Therefore, the number of life cells in either Rb or Rl is less than n. Application of the rule 2n to the rectangles Rb and Rl is not affected by the omitted cells. It follows by induction hypothesis that the populations of both rectangles, Rb and Rl, will die out in not more than n-1 steps. So, in n-1 steps, the only survivor may be located in the lower left corner of R; but this will be eliminated in 1 additional step. s1 + s2 + ... + st = n.
It takes fewer steps if some of the expiration processes proceed in parallel. Note, there are indeed n-cell populations that expire in exactly n steps. The diagram below gives one such example for n = 9. With rules 3n and 4n, the population shrinks even faster than under rule 2n. Under rule 3d, the bounding rectangle does not remain fixed, but rather moves leftwards. Its left edge stops moving after reaching the situation in which it contains a single live cell. On the other hand, the right edge moves rightwards inexorably emptying the rectangle in a finite number of steps. How many does it take? Under rule 3d, any population in a bounding rectangle with k cell rows and m columns, will die out in at most [k/2] + m generations. But it may take that long only if there are at least 2 live cells in each column, i.e. when n > 2m. We must also have n > k, which would imply n > [k/2] + m. But these estimates are exaggerated. The populations in non touching bounding rectangles live and die independently and in parallel. 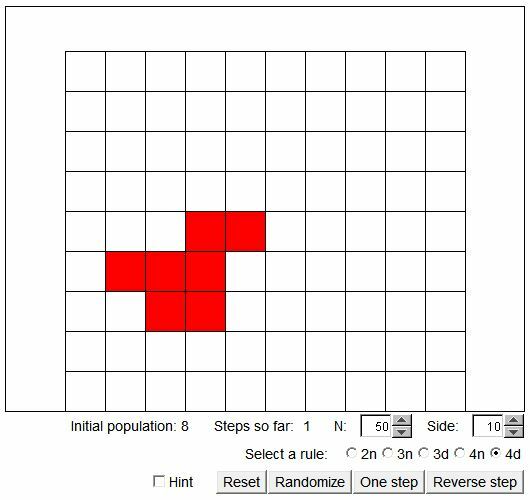 Thus if n = n1 + ... + nt, where ni is the number of live cells in a rectangle of size ki×mi, such that no two rectangles have live neighbors, the population will shrink as slow as the slowest of those rectangles, in which ni > [ki/2] + mi. But clearly n > ni, for any I.